How Quickly Will a New Domain Name Rank? When it comes to search engine optimization, domain name age is certainly one of the factors that goes into how well a website ranks. If you have a domain that’s been around for a decade, it’ll be much easier to get that website ranking for your keyword than it would be with a domain name that was recently registered and has never had an actual website with content on it. We recently received a question from a client with one of our amazing predesigns mentioning the fact that they have been blogging actively for awhile, but their site is still no where near the first page of Google’s rankings. The domain name for this specific client was brand new as of about a month ago. First of all, talking about “Google rankings” by itself is extremely vague and is useless for the most part, as ranking highly for “Seattle real estate” is a totally different scenario than ranking well for an obscure keyword such as “small teapot with flower cover made in Madison, WI”. Unfortunately, as with most things in the SEO world, there is no simple answer as to how long it will take a domain name to rank highly. It depends on how competitive a keyword you are targeting, and how many links you end up building back to your domain. There are thousands upon thousands too many variables at play to give a blanket response that fits every scenario. So, I think it’s clear there’s no magic pill to bypass the Google sandbox (damn, I know). Your best bet is to keep pumping out great content, and build a bunch of backlinks back to your domain (ideally with great anchor text). If you really want to speed up the process of ranking highly for your keyword, we recommend paying an expert to evaluate the difficulty, cost and to develop a strategic plan rather than just shooting in the dark and hoping a bunch of content takes you to the top of the search engines for your desired keywords. When it comes to search engine optimization, there are two primary components that lead a particular site to rank well for specific keywords: “onsite” SEO and “offsite” SEO. Both are important. Without solid onsite SEO (landing pages, internal linking, alt tags, depth of content, etc), any offsite SEO efforts you undertake are going to be minimized (best case) or completely wasted (worse case). But without offsite SEO efforts (aka link building), it’s not going to really matter how good your onsite SEO is — your site still won’t rank well without external links pointing back at your domain. Virtual Results helps our clients with both onsite and offsite SEO. 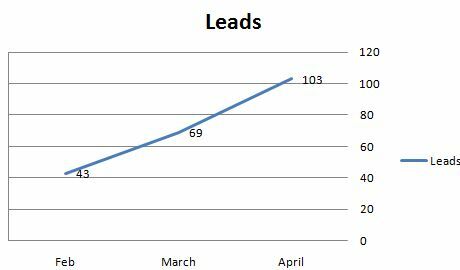 Below are two charts from a client site showing the change in traffic and leads since we did some ONSITE SEO work (we haven’t done any off site work for them) a few months back. Traffic is trending up and to the right. Leads more than doubled. This chart doesn’t include phone calls either, just leads via the IDX. She had very little idea (or did she?) what an inspired discussion would commence. As it is with Twitter, both David Gibbons, Community Director of Zillow and Rudy Bachraty, Social Media Guru of Trulia were listening, and what transpired over the next hour or so was a spirited discussion on SOME of the merits of Zillow and Twitter. Now, this discussion fell quite short of discussing the ENTIRE difference and benefits of the two (although consider this a formal offer for VR to host that discussion… TokBox, maybe?) between the two sites and concentrated mostly on the Search benefits of both. trulia: @davidgibbons @tboard – No offense, but your stage isn’t big enough T- How about Inman SF David? trulia: RT @davidgibbons: @trulia nice try dude, but you’re gonna have to get honest about this one – You’re boring me – what else you got? trulia: @davidgibbons How so David? If The listing is sold and off the market? Where is the value then? davidgibbons: @trulia I’m not sure why you’re talking about solds??? The question is why slap a 302-redirect on the links to listing agents’ websites? trulia: @davidgibbons so agents want a dofollow link to their listings David? trulia: @davidgibbons Well, they can on Trulia – When agents claim their listings, they’re listings are dofollow on their profile = juice…and…. trulia: @davidgibbons …..they also can add 5 dofollow links on their Trulia Profile to the site of their choice…..
davidgibbons: @trulia interesting … but got you beat there too; there’s no limit to followed links (for Pro’s) on Z profiles … next? trulia: @davidgibbons Pro’s on Zillow who pay get unlimited links? trulia: @davidgibbons Don’t forget Facebook 🙂 “Quantity vs. Quality”…..the debate continues…….have a great night all! Now, that you have read the tweetalogue, (just made that up) you probably understand why this is of interest to me… SEO. Within this spirited discussion, there where QUITE a few statements concerning the SEO of both sites. I would like to first create a series of questions from these statements and hopefully provoke a discussion on the benefits of both. 3) Do links that do NOT have favorable anchor text matter. In other words, If the anchor text is an address, and not a keyword you are trying to rank for. 4) Is the address search, a valuable search. I believe David when he states that he has a few million searches a month by address. But WHO AND WHY is someone searching by address and this really a home buyer? 6) And a little “pet peeve” non-SEO question. I have always taught that Realtors should create listing pages for their websites, because the MLS descriptions should be written to help OTHER REALTORS sell the house. Realtors should be able to edit ANY outward facing listing page to appeal to the consumer. I am under the impression, that neither Trulia or ZIllow allow this. Am I correct, and how come? It seems almost eery that within the week I scheduled to write a post on WordPress SEO about the Robots.txt file, I get two…not one, but TWO calls from Realtors who just can not figure out why their sites are not ranking as they should. After careful observation, BOTH of them turn out to be robots command issues… Now granted one was an on page robots (no index) issue, but the other was a robots.txt file issue… Each carry the same message… HEY GOOGLE, DONT INDEX THIS SITE (PAGE) K? So today, we will speak about the robots.txt file… in a week or so, (probably not next week, as two robots posts in two weeks would even bury my eyelids…) we will talk about robots commands, another sure fire way to increase slightly, or DECREASE GREATLY your SEO. Robots.txt is a text (not html) file you add to you root directory that tells the Search Engine Spiders which of your pages NOT to visit. Search Engines do not guarantee they will abide by this information, but typically they do. Most spiders will not go where they are told not to go. A robots.txt is a strong suggestion to a search engine not to index your page. However, it is not a rule… It is a bit like asking someone not to go in a room while you are not home… the room is unlocked, but you trust they will not. Just as you would not leave VALUABLES in that room, do not PROTECT sensitive information by adding it to your robots.txt file. There are way better ways to secure pages. The location of robots.txt is very important. Search engines will not search your site for it. They simply scan the main directory and if they don’t find it, they assume that your site does not have a robots.txt file and they proceed to index everything they find. So HOW do you write a Robots,txt file. Well the simplest way, is to open NOTEPAD and create the file there. robots.txt is exactly what it says, it is a text file named robots not an HTML file. So, notepad is the logical choice. “User-agent” are search engines’ crawlers such as Google Bot or Yahoo and disallow: is a lists of the pages or directories tyou wish NOT to be indexed. You may also see lines of text proceeded by #. These are simple comments and intended for human eyes as opposed to the spiders. Here is an example of Virtual Results robots.txt file. Permalinks are literally permanent links to your blog posts, yeah, the ones that live in your address bar because they contain the address to your blog post (or page). For 2) www.yourdomain.com/category/the-title-of-your-post enter /%category%/%postname%/. *Note that if your .htaccess file is not set to be writeable, WordPress will produce a set of codes which you’ll need to copy and paste to your .htaccess file! Now, I know this is really simple stuff for a lot of you, but please hang with me and SUBCRIBE, because it is going to get a lot more interesting…. Next Post? When is the last time you invested some time in your robots.txt file? Okay, I am a TAD fed-up, just TAD… At almost every Real Estate Internet Marketing event I attend, someone…some Internet-marketing-SEO-real-estate-social-media-twittering-facebook-connected-expert, says something to the effect of “The great thing about WordPress, is that is has UNBELIEVABLE on page SEO, straight out of the box. This started as one REALLY long post… but I think it may end up as a bakers dozen or so… A series of bite-size pieced nuggets to clean up your WP install and make the lean, mean, ranking machine you hoped for when you launched it… Lets start with the Obvious and SLOWLY journey to the esoteric.. well not so fast, lets start with the esoteric..kind of.. go directly to the basics, and slowly get more advanced.. The reason is simple: search engine spiders need to interpret your source code. And while the Internet Explorert and Firefox are very forgiving of your coding errors, search engine spiders, such as Googlebot aren’t quite as kind. Most browsers are very forgiving of bad code. If the browser can interpret the intent or meaning of the site then it will likely display an agreeable page. But search engine spiders are often not as forgiving and something as simple as an overlooked “tag close” can cause the spider to read the code structure differen tthen how the page is displayed in the browser. My opinion? Most validation errors will not affect your SEO at all… but the really bad ones, absolutely will. The only thing you really need to be sure of is that there are no problems in the code structure that would prevent the search engine spider from parsing the code correctly. Proper validation does this. While a page may still get ranked for keywords, improperly developed code may actually keep the page from performing as well as it otherwise could. With that said, in most cases, if a page doesn’t validate it probably still will work for adaptive technologies and search engines, however depending on the errors within the code, it’s not a guarantee. Due to this, it’s best to try and take one extra precaution and begin your project with valid code. PS: If you’re interested in amazing world class SEO, let us know. How did you get better at your listing presentation… Feedback. Each time you gave a listing presentation your prospect showed you comments and body language that properly read coached you to add or omit parts of the presentation… and you got better! So, how do you improve your website without the feedback or BL of the web (analytics)… you simply don’t. The Web 2.0 consumer has a short attention span. This we know. But how short? How many times can we expect a searcher to click on a link or page BEFORE he or she gets exactly what they came for… WHAT THEY WERE SEARCHING FOR… three, two, one… I think not… Let’s try zero. One of the great (unplanned) features of the BLOG is the long tail.. Yeah, Yeah, I know. SEO… But this is not about SEO. It is about the most efficient content delivery imaginable… zero click content delivery. Chances are you will get a site that has “large pink horseshoes” in the description… but when you go to the site? all you see is Large Pink Horses…. Wait is there a link to horse shoes? There is a link to the pair of horseshoes that are on the horse in the picture…. But I want all pink horseshoes….. However if I land on a blog post with content about Large Pink Horseshoes, how many clicks away am I now…. Here is the post…. Zero clicks. Any type of personal BRANDING… Real Estate searchers are looking for …..Real Estate, not Realtors. They don’t care about you. Give them what they came for and hope they appreciate it enough to self-identify. Driving people to your site via other (expensive) marketing. You just invested 12 and half zillion dollars to buy the front page in “Dream Homes on the Cliff with a pool in Belair” Magazine and once you have the readers attention, you drive them to your website? How about a separate and effective call to action, like “pick up the phone and lets go for a car ride! Pertinent, timely, unique and CURRENT information about your market. Average Sales Prices, Inventory Levels, Trends, and your well thought out opinion on the market… You are an authority, right? Prove it. Jim’s article is a breath of fresh air. He gets it.. Do you?